Back in March, my friend Johanna interviewed me about my move. She is a student at Kungliga Tekniska Högskolan (The Swedish Royal Institute of Technolgy) where she is studying, well, it seems she is studying just about everything. I’ve heard her talk about the Media Technology program she’s in and it includes everything from graphic page design to voice synthesis. One of the projects she showed me was a software application she made that can announce the time of day in her voice. Awesome, creepy, scary – I don’t really want any machines talking in the house, especially not in my voice. My sarcastic inner monologue and constant attempts to translate everything are plenty. Another project of the program she’s in involves the periodical publication of a magazine. The program is supported by companies in the printing, paper, and graphics businesses, so the end result of their work – called Uttryck – is quite beautiful. It’s a full-color, perfect-bound magazine on matte paper, assembled by Swedish design students. Let’s just say it’s not your typical college newspaper. The colors are rich, the printing is sharp, and it smells of fresh ink. Mmmmm ink. 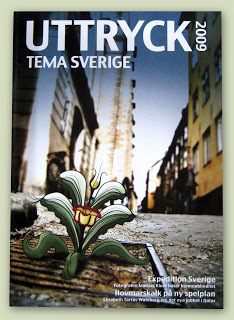 The name Uttryck is another one of those Swedish words like tjänst that means about billion different things: expression, display, statement, utterance, phrase, manifest, et cetera. Ut means “out” and tryck means “print” – so there’s probably some connection or play on those parts. I don’t know. I’m having one of those I’m-never-going-to-be-able-to-speak-Swedish days. You’d think it would be easy to learn a language that only has 37 words. 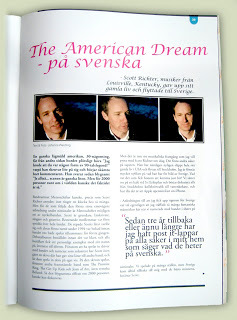 Although the magazine is all in Swedish, I was interviewed in English. This was just a few weeks after I arrived and my Swedish was even worse then than it is now. You can read some of what I said in my March 27th post. 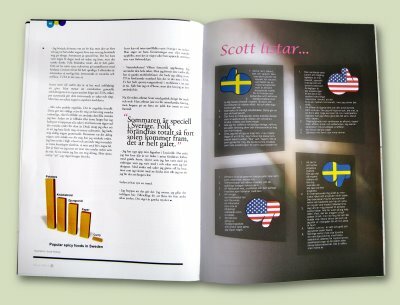 That post also includes some charts I made that weren’t used in the published article and the English version of my lists about Sweden and the United States. The story covers all the bases including why I decided to move to Sweden, what I miss about America, and what I don’t exactly love about both places. We also talked about the process of learning Swedish, food, my then-locked iPhone, and my band, Metroschifter. On the flip side of the coin, I was also interviewed last week for Velocity Weekly, an entertainment newspaper in Louisville. The subject matter was similar, though it was more focused on the new Metroschifter album which is coming out June 30th. Joseph Lord did that interview, which also touched on Kentucky politics and my Senate campaign last year. I’ll provide an update and a link when that comes out… I know you must be desperately hungry to read even more of my chatter. Das Wortspiel funktioniert auch auf deutsch. Es bedeutet sowohl “etwas gedrucktes” (printout) als auch “Äußerung” (expression).